Easily build and manage your own online training. Our Growth program delivers a set of simplified tools for medium-sized organizations. Scroll down for demos and additional information. We are the training experts, so you don't have to be. Take advantage of the latest E-Learning strategies and creative services. Popup Demo: Amazing Executive Dashboard Web App - Free With Every Subscription. Popup Demo: Build a complete PowerPoint-based E-Learning lesson in a few clicks. Often a great fit for smaller organizations, or departmental solutions where the customer plans to do most of the development and operations work themselves. However the FlexTraining learning framework does scale easily to handle several thousand online learners, and it supports unlimited authors and managers. Template-based authoring means your courses are built quickly and with easy navigation, bookmarking, testing, certificates, and course evaluations. Re-use existing material such as manuals, PowerPoints, video, audio, text and images for rapid course development. User-defined courses give you complete control of your content, now and in the future. Responsive design allows course delivery on various size displays with consistent, professional look. Please spend a few minutes with our narrated FlexTraining demos and see for yourself. A flexible menu of professional services and management provide direction and progress while you concentrate on your business. A Training Needs Analysis activity yields a specific deployment strategy. A Content Development Plan identifies where training material will come from and assigns responsibility. 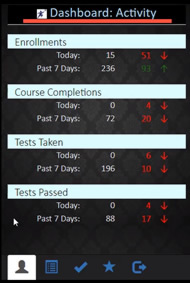 Course Authoring is accomplished with the FlexTraining streamlined coursebuilder, delivering structured lessons and tests. Conversion Planning and execution moves learners and courses from legacy training systems to the latest FlexTraining platform. Hosting, Tech Support, Upgrades, Backups, and Operations Management provide ongoing peace-of-mind while the training system delivers results. Every training initiative has its own goals and challenges. Tell us about your project here. Quick Look: Got video? Build a Video-based online lesson in a few clicks. Download a PowerPoint with the latest training features. Sign up for a complete system supported trial. Conduct some free research on E-learning tools. Use a self-service form, establish your own complete training site. Send us a question on E-learning tools. Watch two 4-minute online demos.